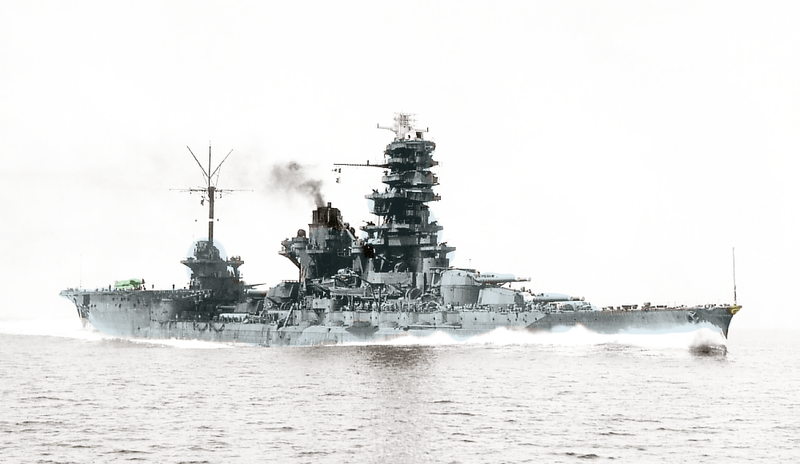 This Ise-class of dreadnought battleships consisted of Ise and Hyuga and were built for the Imperial Japanese Navy (IJN) during World War I. 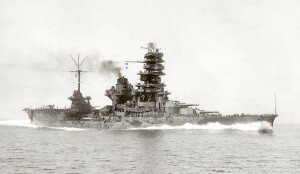 Although it was intended to follow the preceding Fusō class, they were redesigned. 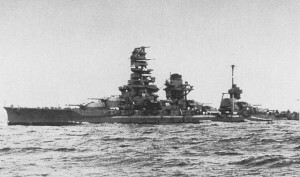 Like the Nagato-class, they also carried supplies for the survivors of the Great Kantō earthquake in 1923, participating in a large scale humanitarian task force, one of the first operations of this type in the history of navy. They were modernized in 1934–37 with improvements to their armour and machinery and a rebuilt superstructure in the pagoda mast style. Afterwards they played a minor role in the Second Sino-Japanese War. They were considered obsolete, like Fuso and Yamashiro, for the WWII. However, after the loss of many carriers in the battle of Midway, they were partially rebuilt as a hybrid carrier-battleship. They were modified with a flight deck replacing the rear pair of gun turrets to give them the ability to operate an air group of floatplanes. A lack of aircraft and qualified pilots, however, meant that they never actually operated their aircraft in combat. While awaiting their air group the sister ships were sometimes used to ferry troops and material to Japanese bases. They participated in the Battle of Cape Engaño in late 1944, where they decoyed the American carrier fleet supporting the invasion of Leyte away from the landing beaches. Afterwards both ships were transferred to Southeast Asia and in early 1945 they participated in Operation Kita, where they transported petrol and other strategic materials to Japan. Both units were then reduced to reserve until they were sunk during American airstrikes in July. After the war they were scrapped in 1946–47. 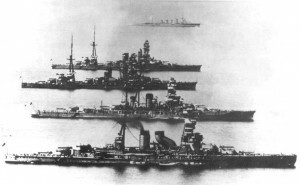 An impressive photo with Hyuga, kirishima, Nagato and Ise battleships. The pagoda tower style is spectacular.